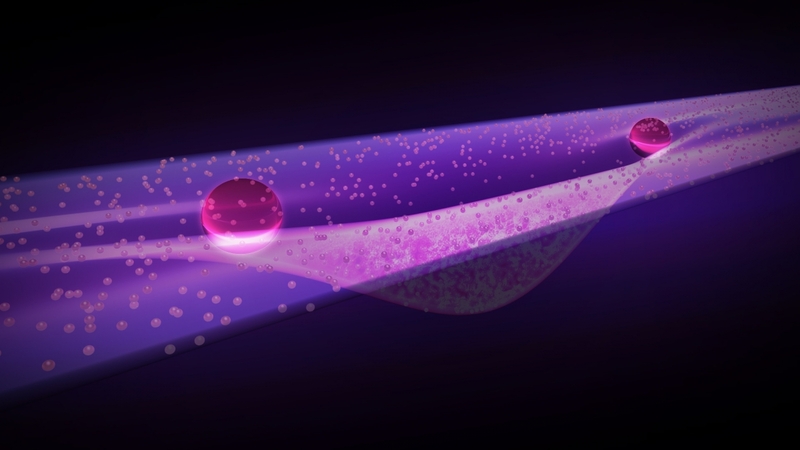 A Bose-Einstein condensate (BEC) forms inside a quasi-one-dimensional trench amid a two-dimensional gas of ultracold atoms. These atoms had already been put into a fractional quantum Hall (FQH) state. The trench acts as a defect where two quasi-particles (area indicated here with two large glass spheres) can be snagged. This pair of quasi-particles together constitute a "para-fermion" and might serve as a handy qubit. In the fractional quantum Hall (FQH) effect, the collective action of electrons in a material form particle-like “quasiparticles” that can appear to possess fractional charge, such as 1/3. In quantum Hall systems, these quasiparticles can become trapped around specially tailored defects, forming so-called "zero-mode" states. One example of a composite particle associated with zero-mode defects is the Majorana fermion. Many physicists believe that the quantum Hall physics enabling these zero-mode states is not unique to electrons, and thus it should be possible to observe this behavior in other systems. A recent PFC-supported report proposes producing one such state, called a parafermionic zero-mode, in a gas of cold bosonic atoms. In this case, the defect that captures the quasiparticles is a one-dimensional trench of Bose-Einstein Condensate (BEC) atoms sitting amid a larger two-dimensional formation of cold atoms displaying FQH properties. The parafermion would appear at both ends of the trench, just as Majorana fermions can appear at either end of a superconducting nanowire.